Lovely Sea views. 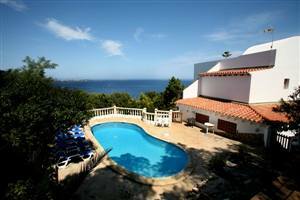 Siesta, walking distance to the beach and Santa Eulalia. Plenty of space and a great feeling of luxury, this villa is oozing with character and complimented with many Spanish antiques and curios. The bathrooms and kitchen are newly fitted to a high standard. Bedrooms are spacious and the Master bedroom en suite has its own terrace and private lounging area,taking up the whole of the first floor. Large garden with direct access to the beach. Plenty of private parking and mesmorising sea views from terraces, pool area and most rooms. Superb location to bask in the sunshine and enjoy gentle sea breezes, whilst being surrounded by the multicoloured countryside. This property is nestled amongst fragrant pines, in a residential Urbanisation. Here you can enjoy the benefit of being able to walk to the beach and the town of Santa Eulalia, with its many restaurants, shops and cafes and the Marina. This property is itself situated on the edge of Siesta urbanisation, a sleepy residential area just the other side of the river from Santa Eulalia itself, with some fabulous laid-back restaurants and cafes, and many panoramic photo opportunities. With some good small shops and cafes/ restaurants in the Urbanisation, there is no need for a car with this villa. You can walk to the cosmopolitan town of Santa Eulalia via a bridge over the only river on the Balearic Islands. Ideal for country or coastal walks. Fully equipped kitchen to a high standard. Large lounge with fireplace, aircon and a large terrace overlooking the whole of Santa Eulalia, and the Marina and bay. There are 3 double bedrooms on this floor and a single bedroom with its own shower room. (This bedroom is accessed via a double bedroom or via an outside door). Master bedroom takes up the whole of the first floor having its own lounging room, kitchenette, and fully fitted bathroom with private access to the roof terraces.